The best conference swag I’ve ever received was an extra phone charger battery (pre-charged). As the Director of Online Marketing at SparkPost, I take an interest in the items we choose to give away (and what items resonate with people), as we’ll periodically host giveaways on social media – Jennifer loves any excuse to send out swag to our community members. Random internet question for conference goers.. what kind of stuff do you find valuable for companies to give away? The responses were overwhelming. They ranged from a Macbook Pro with an app store gift card to really nice pens, Swell water bottles or functional USB hubs. I think it really depends on the audience, don’t you? I am a marketer, so I recently dropped my business card in a fishbowl at a conference for a chance to win a 3-D printer – I mean who wouldn’t? Can you imagine what I could make with one of those? I would have dropped my business card in there a hundred times if it had increased my chances! But the fundamental problem with booth giveaways and raffles is that you know you are going to eventually be nagged by a sales person to buy their product or service. Am I right? So you’re more apprehensive and less willing to let booth staff scan your badge or drop your business card in, unless you really think it’s worth it. I mean if you could just sneak up to the booth without anyone seeing you and snag some swag, that would be the best – but that’s not realistic. At events we’ve sponsored in the past, we’ve given away various t-shirts, flasks, graph pads, bottle openers, laptop stickers, iPads, iWatches, drones and BB-8s. On social media, we’ve given away Stance Star Wars socks, Star Wars comic books, and recently in an email we gave away limited-edition client library laptop stickers (which you might still be able to score at a future dev event). But we’ve never really asked you, what would you find most valuable? Let us know in the comments below and maybe you’ll see it at a future event or on social. p.s. 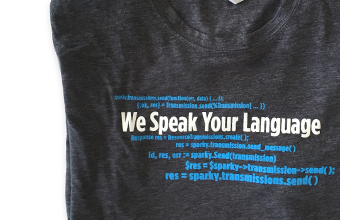 Of course, you can always get one of these free dev t-shirts for signing up for a SparkPost account – we have women’s dev sizes as well! I actually just got a sticker in the mail from Spark Post! It was unexpected and really made my day, I am obsessed with lap top stickers! The little note was cute and thoughtful too. Hi Beverley, Thanks for the feedback! I’m glad you liked the stickers and thanks for the shout out on Twitter as well. FWIW, Jennifer is *not* in charge of the Velocity conference. The conference is run by O’Reilly Media and chaired by Courtney Nash, Steve Souders and James Turnbull. Official conference swag is chosen by O’Reilly’s marketing department. Thanks for bringing this to our attention, we have updated the post!